<b>Old City Hall, 1960s. City of Toronto Archives, Fonds 220, Series 65, File 651.</b><br><br /> “$260 Million Eaton Plan To Include Old City Hall” screamed the front page of the <i>Globe and Mail</i> on September 16, 1965 when the department store giant unveiled its vision for the Yonge-Dundas-Bay-Queen block. As proposed, the Eaton Centre encompassed a shopping centre to replace Eaton’s aging buildings, along with five office towers. Except for its clock tower and cenotaph, Old City Hall was destined for the scrapyard. Protests led by Friends of the Old City Hall showed public support for the building. Among the building’s defenders was former Governor-General Vincent Massey. “Surely it should be possible,” he wrote in March 1966, “for an intelligent study of the area concerned to be undertaken which could result in a plan accommodating the needs of the developers and at the same time restoring to useful life this most distinguished historical building.” City councillors slowly came around to criticize the project, requesting guarantees based on past half-finished Eaton’s projects like its College Street store. In May 1967, Eaton’s scrapped its initial Eaton Centre concept, though it was later revived and evolved into the complex we know today. Supporters of Old City Hall had the last laugh, as it outlasted the department store. <b>Row of ticket offices during construction of Union Station, June 13, 1923. City of Toronto Archives, Fonds 1266, Item 908.</b><br><br /> Like Old City Hall, Union Station was threatened by a major redevelopment project. In this case, Canadian National and Canadian Pacific joined together to pitch the Metro Centre, which would turn the rail lands into 187 acres of apartments, institutions, office towers, and retail. Conceived in 1967, the plan would have replaced Union Station with four towers. Preservation groups formed, while battles over land ownership slowed the plan’s progress—at one point, city council debated the matter for five days straight. Proponents blamed the furor over the Spadina Expressway cancellation for fuelling the public outcry. With the election of a less developer-friendly city council in 1972, support within City Hall ebbed—Mayor David Crombie called for the station’s preservation. An intergovernmental committee was struck, resulting in Premier William Davis’s announcement in May 1975 that Union should not only be retained, but expanded to handle increased commuter traffic. <b>The Provincial Lunatic Asylum/Queen Street Mental Health Centre, 1884. Toronto Public Library.</b><br><br /> Sometimes a building’s dark past condemns it, as was the case with 999 Queen Street West. When demolition of the aging mental health facility was proposed in the late 1960s, administrators, media, and politicians conveyed the impression that the building itself, whose earliest portion was designed in the 1840s by John Howard (who later granted High Park to the City), was evil. The City used the recently enacted Ontario Heritage Act to attempt to stop the demolition in the mid-1970s. The Toronto Historical Board commissioned architect Jack Diamond to study renovation possibilities for the Howard section, and he came up with a figure that was half of the provincial estimate. Despite the contention of architectural historians like William Dendy that it was past administrators, not the structure, which resulted in inhumane conditions for patients, demolition began in December 1975. In his book <i>Lost Toronto</i>, Dendy ruefully noted that “the site is now another parking lot.” Further redevelopment resulted in the current site of CAMH. <b>Old Don Jail, circa 1949. City of Toronto Archives, Fonds 1244, Iten 1152.</b><br><br /> Like 999 Queen Street West, the Don Jail was tarnished by the brutal treatment of its inmates. When <a href+"http://torontoist.com/2013/08/historicist-what-to-do-with-the-don-jail/">the old jail closed at the end of 1977</a>, Ontario Minister of Corrections Frank Drea declared the building “a monument to human degradation and misery” lacking in historical value. Arguments divided between those who believed the building should be wiped off the face of the earth, and those who valued its architectural merits or felt it should stand as a reminder of the darker aspects of our city’s past. A childish ceremony was held wherein dignitaries whacked the walls with sledgehammers. The City studied new uses for the building, which was eventually converted into administration facilities for Bridgepoint Health. <b>Riverdale Hospital, March 14, 2007. Photo by <a href="https://www.flickr.com/photos/emangrooving/436563491/">Erik Twight</a> from the <a href="https://www.flickr.com/groups/torontoist/">Torontoist Flickr Pool</a>.</b><br><br /> While Bridgepoint Health held on to the old Don Jail, it showed less regard for the adjacent modernist semi-circular structure built in the early 1960s as Riverdale Hospital. Attempts to save it ended at the Ontario Municipal Board in 2007. On the panel, architect Alex Spiegel believed the structure could have easily been converted into condos or a seniors residence. 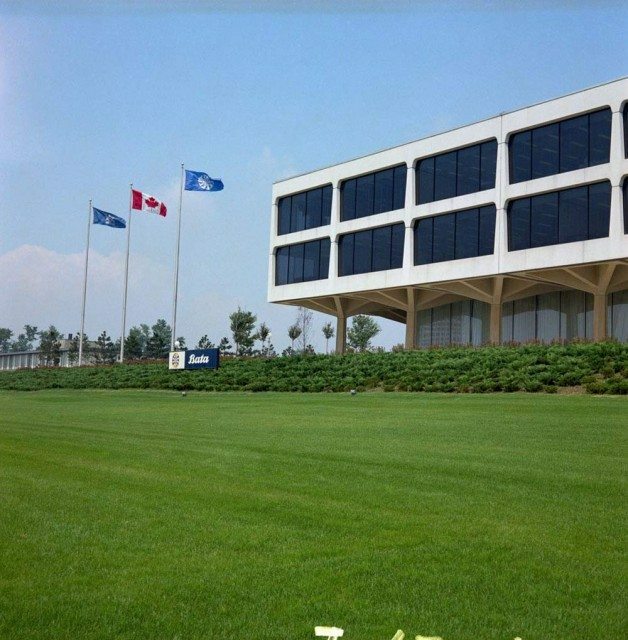 <b>Bata Headquarters, late 1960s. City of Toronto Archives, Fonds 217, Series 249, File 356, Item 023.</b><br><br /> In some cases, the loss of an architecturally important building may be tempered by a landmark replacement. Downtown, the Bank of Toronto’s colonnade-rich head office gave way in the 1960s to Mies van der Rohe’s Toronto-Dominion Centre. In Don Mills, John B. Parkin’s modernist Bata Headquarters was cleared to make way for the Aga Khan Museum and Ismali Centre. <b>Inn on the Park. <i>The Inn on the Park: Toronto’s Magnificent Convention Hotel</i> (North York: The Inn on the Park, circa 1966).</b><br><br /> Modernist architecture is taking a beating in Toronto, often suffering from a perception that because it was developed within many people’s memories, or involves styles that are no longer fashionable, it is not worth preserving. <a href="http://torontoist.com/2014/07/historicist-the-inn-on-the-park/">The Inn on the Park</a>, the last project designed by architect Peter Dickinson, was cited by the panel as a prime example. Adding insult to injury, its demolition in 2006 began a day before North York Community Council voted on a heritage designation. <b>National Ballet School/Radio City Condominiums. Photo courtesy of Heritage Toronto.</b><br><br /> Located on a site previously occupied by the CBC (and including an early incarnation of Havergal College among its buildings), the panel regarded these neighbouring projects as a good example of adaptive reuse which both respects the heritage structures and adds its own creative touches. <b>Concourse Building mosaics, 2013. Photo by Jamie Bradburn/Torontoist.</b><br><br /> On the other hand, the current remaking of the <a href="http://torontoist.com/2013/06/goodbye-concourse-building-hello-ernst-young-tower/">Concourse Building</a> was criticized for succumbing to facadism. Two sides of the art deco office tower, known for its colourful mosaics created by Group of Seven member J.E.H. MacDonald, are being integrated into the Ernst and Young Tower. What is the historical value of a building—does it lie in its architectural style, or in the historical events that have taken place within its walls, or merely in the sentiment it inspires? How we answer those questions may determine how successfully we’re able to preserve Toronto’s past—a recurring notion at Wednesday night’s panel discussion on heritage preservation, presented by Heritage Toronto at the Toronto Reference Library. While preservation wins and losses over the past 40 years provided the framework for the discussion, the panelists also delved into broader issues that affect how we preserve buildings. Among them was one that heritage watchers love debating: partial retention (or, as it’s more commonly known, facadism). Simply grafting a fragment of an old building onto a new structure can result in the loss of the former’s historical context. Architect George Baird pointed to the practice of dismantling sections of historic buildings and then reassembling them to the point where they look so new their age value disappears. Cathy Nasmith, president of the Toronto chapter of the Architectural Conservancy of Ontario, noted that the value of a building lies as much in what has happened inside—and in its historical patterns of usage—as in the physical structure itself. The sense of life unfolding within a building, as well as the sense of losing familiar architectural icons, may explain why certain losses or heritage threats hit us harder than others. Consider the anger that erupted over the demolition by neglect and subsequent fire at the Empress Hotel, or the passion behind the campaign to save the Sam the Record Man sign. Developers and residents are now gaining respect for works of architecture beyond standard business and government buildings. Harold Madi, the City’s director of urban design, pointed to a recent increased appreciation for industrial heritage properties. Though it wasn’t mentioned, one can look to projects such as the Longo’s in Leaside, a former locomotive repair shop that honours its past life. Inspired by the discussion, our gallery includes a sampling of Toronto’s heritage preservation wins and losses since the 1960s. Additional material from Lost Toronto by William Dendy (Toronto: Oxford University Press, 1993); Toronto Observed by William Dendy and William Kilbourn (Toronto: Oxford University Press, 1986); Unbuilt Toronto by Mark Osbaldeston (Toronto: Dundurn, 2008); the September 16, 1965, March 17, 1966, and November 11, 1977, editions of the Globe and Mail; and the April 25, 1960, June 8, 1960, and January 8, 1976, editions of the Toronto Star.